Motorola voice terminal VT1005; how to connect it up and a description of lights and the back panel. Power- This light should be solid green. It will light up when the router is powered on and will flash as at the VT1005 voice terminal is booting up. This sequence should only will last for a brief time. If the power light flashes continues to flash longer than usual it is receiving new firmware and should not be disconnected or unpowered. Caution: Do not un-power or disconnect your VT1000 or VT2442 if the power light is flashing. Power - Connection for 12 volt adapter. 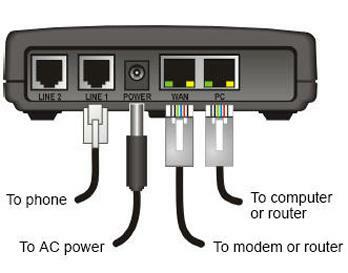 PC port - RJ-45 Ethernet port for computer or other LAN device. 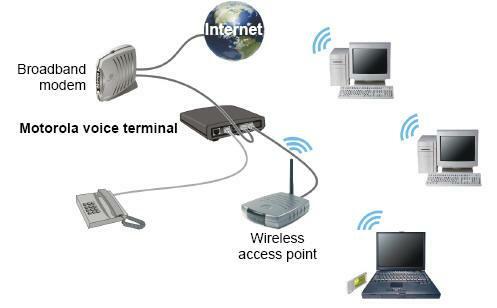 WAN port- this would be the connection to your cable or DSL modem. Phone 1 & 2- These RJ-11 connections are for your phone lines, phone 1 only being active for 1 line. If you subscribe to two lines then Phone 2 would be for your second phone. Note: The WAN and the PC ports each have two corresponding lights. The green light is on when the Ethernet connection is available. It will flash when data is being transferred. The yellow light will be lit if there is a 100Base-T connection and will not be lit for a 10Base-T connection.